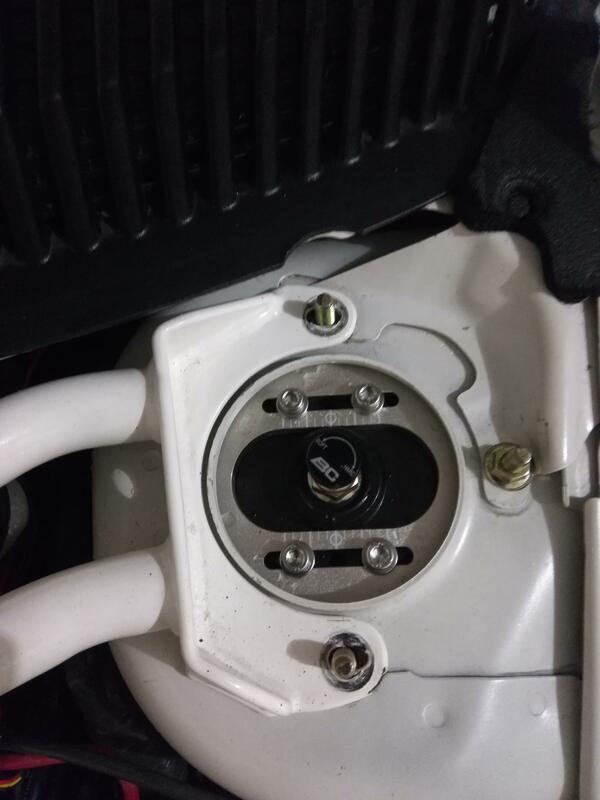 Strut tower bar does not fit after coilover install? So my car had front and rear DC strut tower cars. When I upgraded the suspension from my stock struts/Hotchkis springs to BC coilovers I did not put my strut tower braces back on. Well I went to try to put them on and they will not fit now. Here is the picture of the front. Way off on the passenger side. If I put passenger side on then the drivers side doesn't fit. Rear does not fit either anymore. What gives? Does the front/rear need to be up in the air when putting it back on? Never had issues when I took the front off on stock suspension. Help would be great. I am sure I am missing something easy I hope. Have you tried tried spinning them 180* horizontally, right side on left and left on right? Are you sure that is the front bar and not the rear? Just asking............ 'cause they should fit unless the towers - front and rear - moved somehow. Yeah they can only go one way due to the design. Would be up in the cowl if it got spun around aka put on backwards. Yup, my front bar is powdercoated white. Rear is not powdercoated at all. So they are where they should be. I am guessing the bolts or something are in a slightly different place then the OEM struts. I still have the OEM struts, I need to measure the differences between the bolts. If that were the case they wouldn't fit through the body. Try lifting the car and see if they fit. The bar didn't get flattened while it was off by chance did it? No the bar didn't get flattened. I yet to try it with the car up in the air yet... I didn't need to do that when I had stock suspension on though. If I remember correctly (back in 2004) my PWERKS rear 3-point strut tower bar had a similar problem when installing it. I had previously installed Mopar Stage 3 Coil Overs several weeks beforehand. 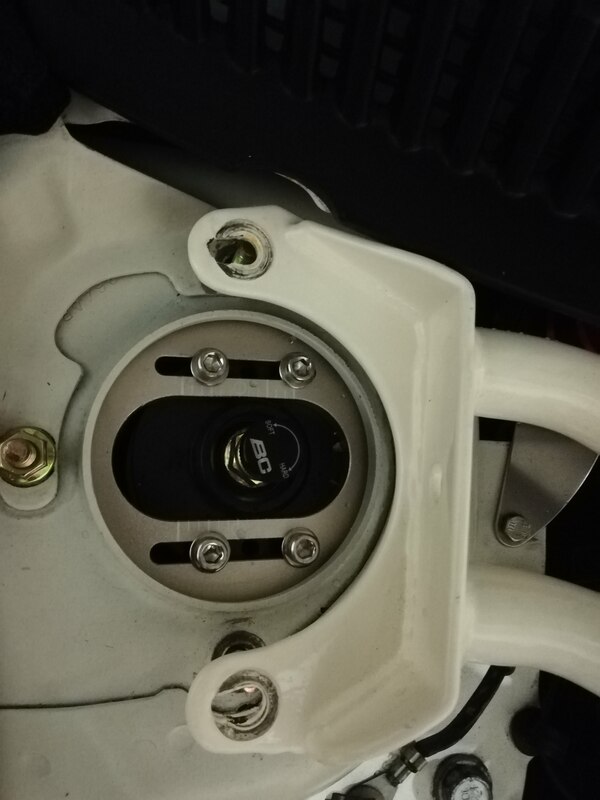 I eventually found a solution by jacking up the side of the car where the bolt holes on the strut bar didn't align. Point is, it takes a while for the car to "settle" after a coilover install so drive it around a few thousand miles without the FSTB. Then see if jacking the car up either independently on each side or both sides together solves the problem. I don't think these cars really need an FSTB because the shock towers are so close to the firewall and the shock towers are already heavily gusseted anyway. My car once wore a DC Sports FSTB and I'm not sure it did much except get in the way of the turbo, coolant overflow tank etc. I eventually gave it away to a local SRT-4 club member who painted it bright read and I must say it looked pretty under the hood of his red car. Last edited by Simon.Starkie; 01-15-2019 at 11:50 AM. 90-95% of us don't have a front crash bar anymore. That front strut tower brace did wonders for me. Yes, removing the front crash beam in order to fit a big FMIC certainly reduces front'end chassis stiffness. Without a crash beam, the only thing tieing the front of the car together is the radiator support which is quite flimsy in comparison. So I'm sure in that case, a sold FSTB helps and is slightly better for handling than no crash beam at all although a crash would still be worse. Nevertheless. removal of the crash beam can increase the amount of damage that occurs when a front end collision occurs, even a small ones. As a matter of fact, my car hit a deer in 2004 shortly after I installed an ED FMIC which Hector had given me a good price on. The repair bill was over $6k because a new radiator support added significantly to the bill. Luckily, the repair shop was mum about it with the insurance adjuster but as soon as I got the car home, I put the crash beam back in. And gave the ED FMIC to my friend Jeff Lepper when he later installed my Stage 3 turbo kit for me. I noticed right away that the car handled better in the twisties with the crash beam reinstalled. But as mentioned, I didn't notice much difference with the removal of the FSTB. Last edited by Simon.Starkie; 01-15-2019 at 05:59 PM. Are you undoing all three nuts? Photos indicates you are leaving one nut tightened. Sure the FSTB bracket only has 2 holes. But perhaps you need to loosen all 3 nuts. On BOTH sides ALL at the same time. To get it to fit. Also, maybe untighten ALL those allen bolts on the top hat/camber plates. You will lose the camber but again, maybe you need to loosen EVERYTHING to fit the FSTB. Another thing to try - disconnect the sway bar on both sides. I know that's a long shot because the sway bar is at the other end down below. But it's surprising how even a small amount of tension at one end can influence the fitment at the other end (the top in this case). Chassis mods and suspension work are a black art, no doubt. Last edited by Simon.Starkie; 01-16-2019 at 10:38 AM. it's more likely that you have to get it lined up on all 4 bolts at the same time rather than one side and then the other. Or the rear ones first then the front ones...with the third nut out as mentioned. No car. Searching... Found it! Great tip will try it out. Yeah I know it doesn't much I just wanted to put it back on for car shows since it looks great in the bay. Yeah not going to mess with the camber allen bolts unless I plan on getting another alignment. No I only undid the two. I will give that a shot first. Good looking out on the sway bar too, not sure how much that would affect things I have the Hotchkis sway bar front and rear but that was isntalled by the prior owner. Another thing I did and I don't thing I had the strut bar on at the time... I went BFMIC..But I bought the SDK crash bar and installed that, not sure if tightening that down changed the tower bolt holes. I doubt it. Thanks guys for all the helpful suggestions I will try them all out. I REALLY want to get the rear strut bar more then the showy front one. Because I know the rear helps a bit on the 2gn Neons. honestly, if jacking up the car/removing sway bars/changing crash bar could have that much effect on the strut bar bolts, it would be a clear indication of how much help a strut bar could provide in keeping the front end all tied together. i just dont buy it. remove all 3 nuts. you may have to do a little wiggling or jiggling but it should go on without issue... reinstall all 3 nuts. enjoy.